IEC Novosibirsk Expo Сentre, Novosibirsk, Russia The exhibition for food and drinks InterFood Siberia is one of the largest food industry exhibitions in Siberia. sale and retail trade companies, public catering enterprises, interested in purchasing products for solving production problems. The exhibition is visited by the leaders and experts of wholesale and retail trade companies, public catering enterprises. Visiting the exhibition InterFood Siberia offers the opportunity to bring up to date the assortment of food and drinks due to a wide range of products displayed by manufacturers and suppliers from Russia and abroad. In 2015, the exhibition was visited by 3450 people, most of them were representing Novosibirsk, Kemerovo, Tomsk regions and Altai Territory. 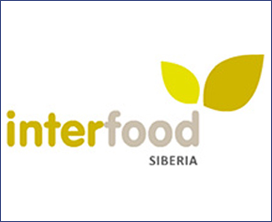 According to the research conducted at the exhibition, 2532 attendees of Interfood Siberia are a unique audience for the participants, because they do not visit other exhibitions of this topic in Russia. At that, 862 attendees of the exhibition InterFood Siberia are budget holders and take final decisions on the procurements in their companies, 1528 attendees recommend which items should be ordered. Summarizing the results of the exhibition, 2093 attendees consider InterFood Siberia useful for decisions about company's future orders*. Participating in the exhibition allows to increase the volume and to expand the geography of food and drinks sales on the market of Siberia through direct contact with the heads of a large number of wholesale and retail trade companies, public catering enterprises, interested in purchasing products for solving production problems. The exhibition is visited by the leaders and experts of wholesale and retail trade companies, public catering enterprises. In 2015, the exhibition was visited by 3450 people, most of them were representing Novosibirsk, Kemerovo, Tomsk regions and Altai Territory.